Welcome Back to Meatless Fridays. The more I do these posts the more challenging it becomes. For today’s effort I had a taste for something South of the Border. 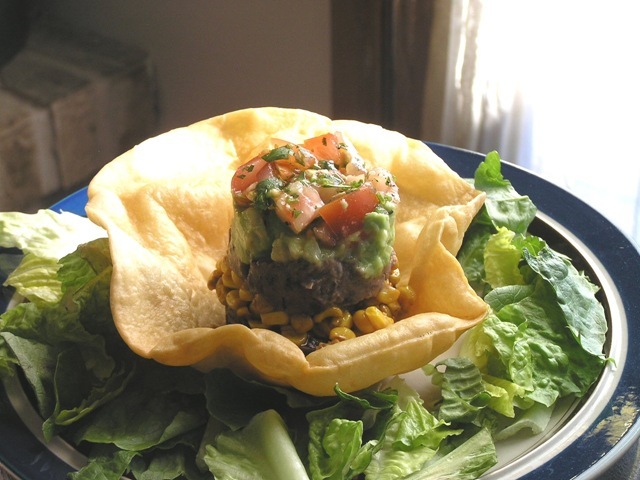 I have always loved a Taco Salad but wondered if I could get all the depth of flavor without the meat. I believe I came up with a very satisfying answer. I began by making the shell. I heated a pan of vegetable oil to 350 degrees and dropped a flour tortilla in. I then used a big ladle and pushed it down. The tortilla curled around the ladle to make my bowl. 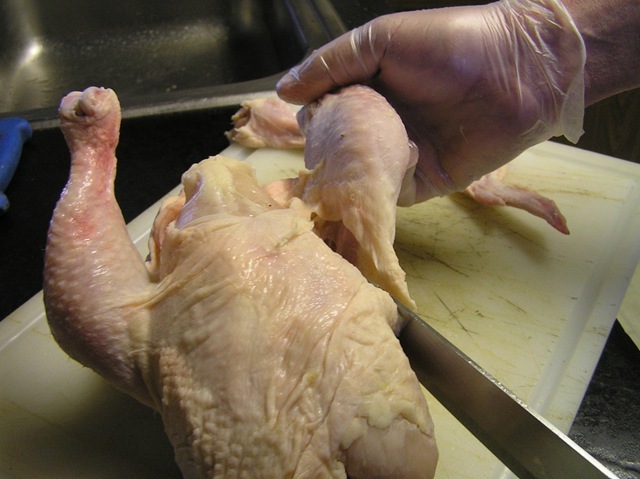 When it had crisped I carefully turned it over with a pair tongs to complete the crisping process. I then drained my shell on a paper towel and let it cool. I though about the flavors I wanted in my Taco Salad. Beans,Tomato, Avocado and Corn all came to mind. Rather than just toss the ingredients together I decided to deconstruct the Taco Salad. I took a ring mold and began layering. First Beans,than Corn,more beans,Avocado and finally Tomato and Cilantro salad. I must confess I was very pleases with the results. As with all great dished every element on the plate comes together and just pops in your mouth. Sauté 1/2 the onion with the garlic until translucent. Add the Black beans and cumin to suit your taste and toss until the beans are warm. Season with Kosher salt. Remove and mash slightly. 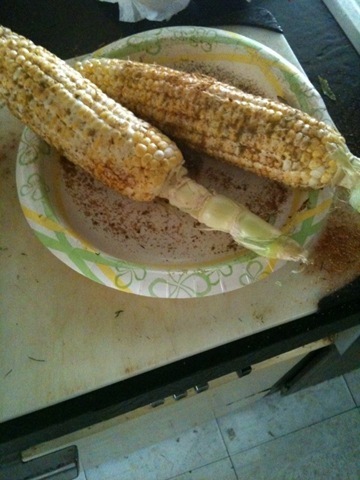 Drain the corn and toss in a pan with the chili powder. Season with salt to taste. Dice the Avocado and toss with the remaining onion and 1/2 the lemon juice. Add some Olive oil to carry the flavor. Make a quick tomato salad using diced tomato, chopped Cilantro, Olive oil and the remaining Lemon Juice. Fry the flour tortilla in vegetable oil using a ladle ( or other implement) to hold the center of the tortilla in the oil creating a bowl. When it begins to crisp gently turn it over to complete the frying process. While I took the time to make a tower this really isn’t necessary. 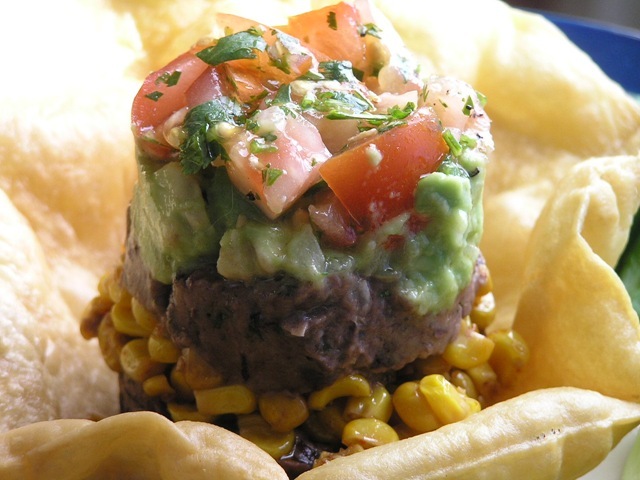 Put a scoop of your Black beans in the bowl and top with the corn, Guacamole and Tomato and enjoy. With as much snow as we have had here in Michigan I felt the need to step up my hearty meal intake. When the temperature take a dive I like to help keep the house pleasant and warm by preparing a lot of stewed or braised foods. 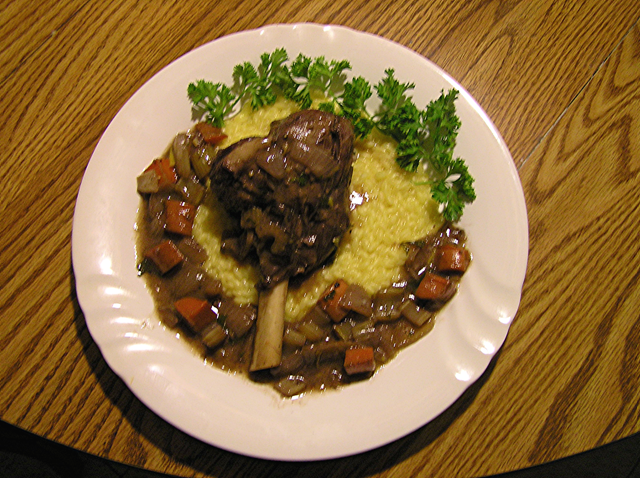 One of my favorites is braised lamb shanks. I try to purchase them when they are on sale and save them for the proper occasion.Lamb ( and beef or Pork ) Shanks have a tremendous amount of gelatin. This makes any preparation with them extra special. 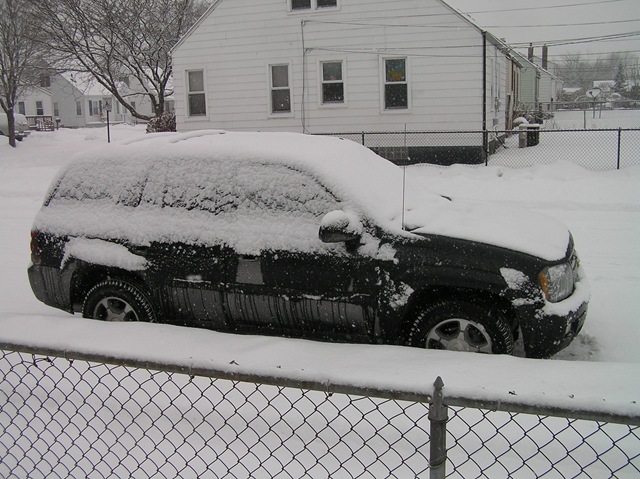 Having dug out of the storm earlier this week I was surprised when I came back from the store in clear weather only to find the car covered by 2 inches of snow not 10 minutes later. After this I came to the conclusion that this would be a perfect day for the lamb shank I had. Your basic stew relies on the protein and the aromatic vegetables ( Onion,Carrot and Celery). 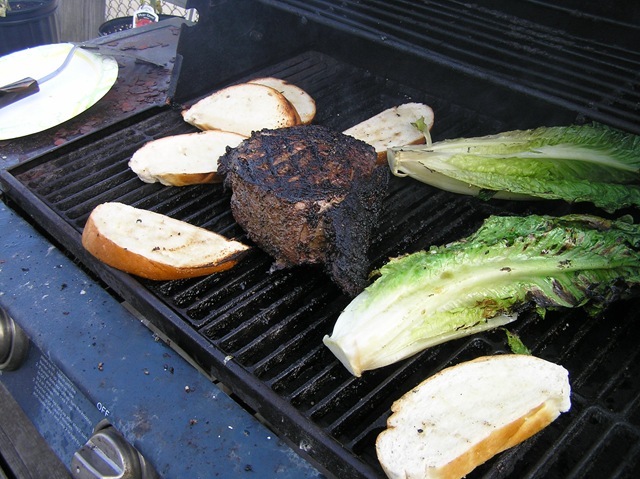 In this version I replace the celery with fennel for a spicy twist. I also add a gremolata towards the end of the cooking process which brings a freshness to the preparation. A gremolata, traditionally, is a combination of fresh herbs, lemon rind,garlic and parley. For this preparation I used the fennel fronds to replace the parsley and orange rind to replace the lemon giving this braise a fresh and exciting taste. As with all Stew/Braises low an slow is the rule!! Return lamb to the pan, add red wine, cover and simmer until tender. Stir in Gremolata and return pan to oven. Continue to cook for 30 minutes. It’s been a long time since my last post. I apologize. 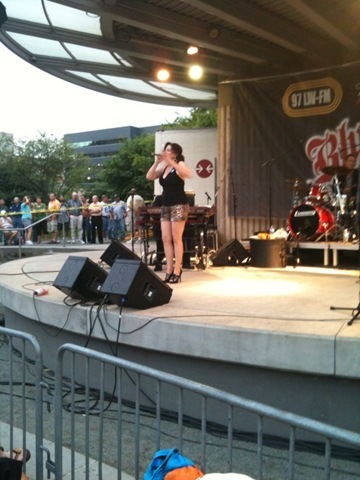 I am feeling it’s time to get back to my second passion,writing!. I). The last couple of time I chose to come down to the island early. The house we rented would not be available until Sunday but I chose to leave Thursday afternoon. 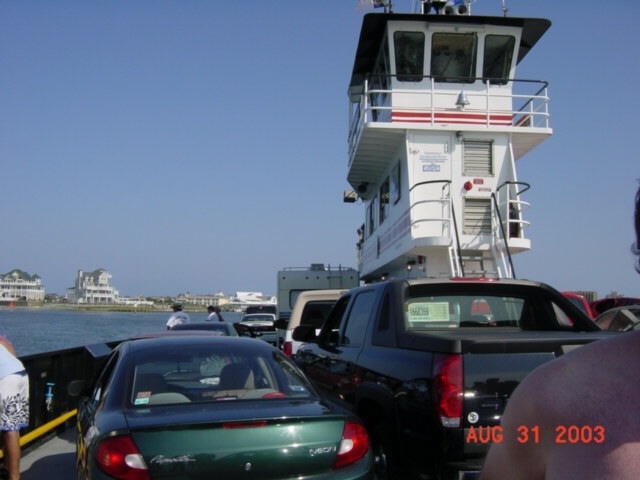 Fifteen hour in the car later I Caught the ferry leaving the workaday world behind. 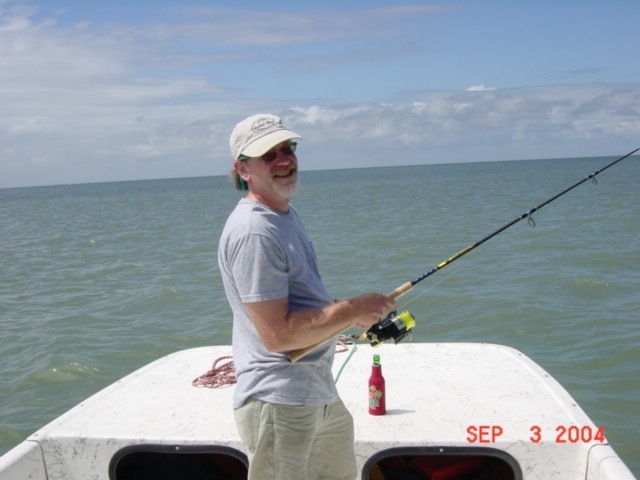 While I am not, generally, a rustic person I have camped on the island,a couple of days, for the last 2 years. 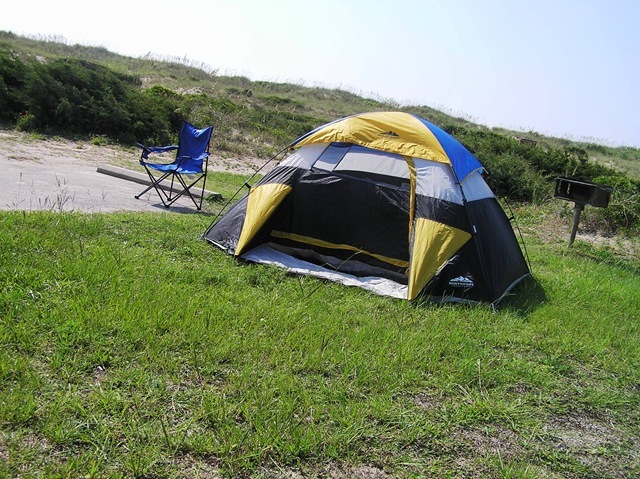 This last year I found myself hanging out at the campground feeling hungry and called a takeout order in to ( what I believe is) the only Thai restaurant on the outer banks. My thought process was that the seafood would be absolutely fresh as almost everything served on the island comes from day boats. I chose the Penang Curry with shrimp. It was everything I expected. Sweet and spicy with the freshest shrimp available and served over rice. I decided that I would have to recreate the dish when I got back to Detroit. I had most of the ingredients I need to reinvent this dish. I always have Pankow Breadcrumbs and and have had Java Curry Cubes in my freezer for some time. The plan is to bread the chicken in Pankow and Coconut and serve it with a Penang Curry Sauce over stir fried Rice Noodles. Wisk milk/water with flour to create a batter. Set aside for at least 10 minute so the Breading will set. In a separate pan combine the Coconut Milk with the Curry paste. Bring to a boil and wisk until combines. Keep warm for service. Cook Rice noodles according to direction and shock (stop cooking )in cold water. 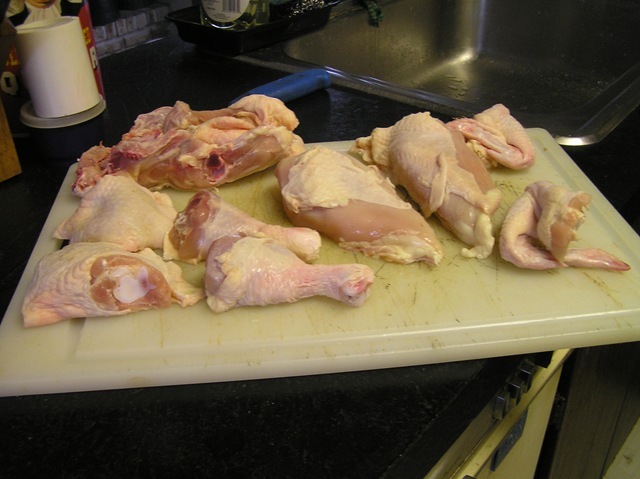 Fry/Sauté breaded chicken in vegetable oil until a golden brown color is achieved. 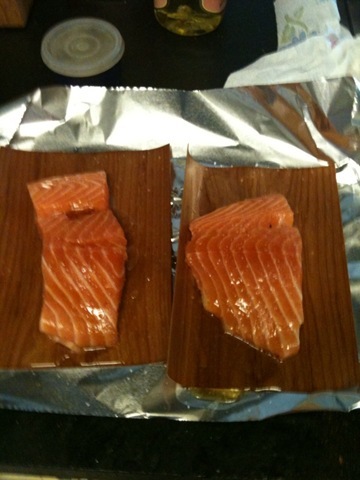 Finish in a 350 degree oven until internal temp is 165 degrees. Stir fry Rice noodles.bean sprouts and peanuts in a little of the vegetable oil until warm. Add1/4 of the curry/coconut mix and toss. Add cilantro and toss again. 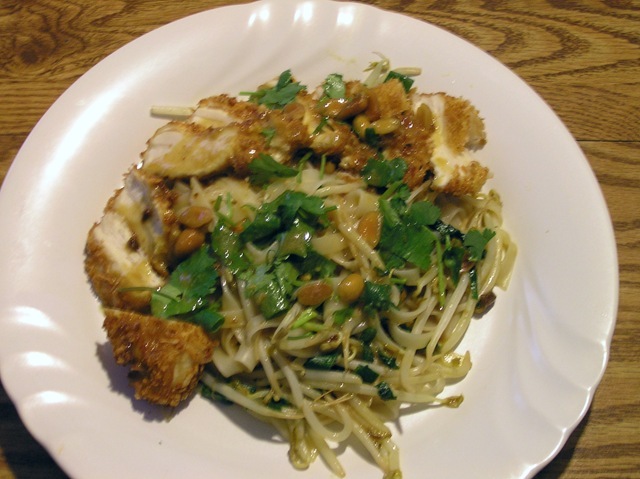 Place a portion of the rice Noodles on a plate and arrange slice chicken around it. Panko is readily available in most supermarkets. The Java Curry paste I used was from a Japanese grocery. It works well with this application. A Red or Green Curry sauce might not work as well in this S.E. Asian preparation. The egg/milk/ flour combo is a Japanese take on Standard Breading Procedure. By creating a batter they eliminate a step. 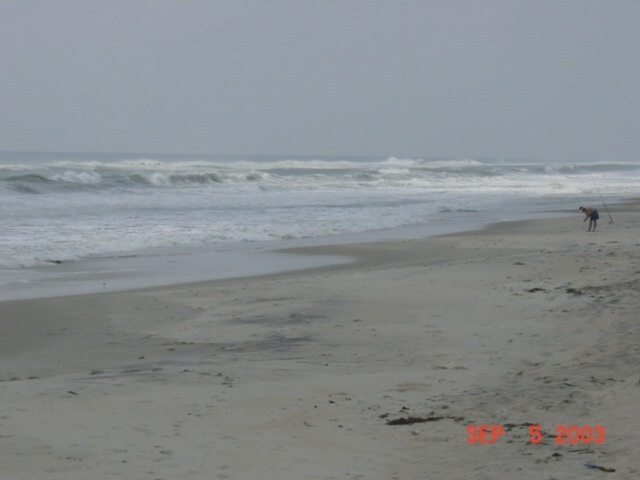 Ocracoke Island has it’s own dialect which, if you listen carefully, you will hear spoken by the Island residents! It’s been in use since the island was settled in the 1700’s. Until the 1960’s wild ponies had the run of the island and the local boy scout troop were the only “mounted” unit of the Boy Scouts due to the fact that they captured and trained the wild ponies. 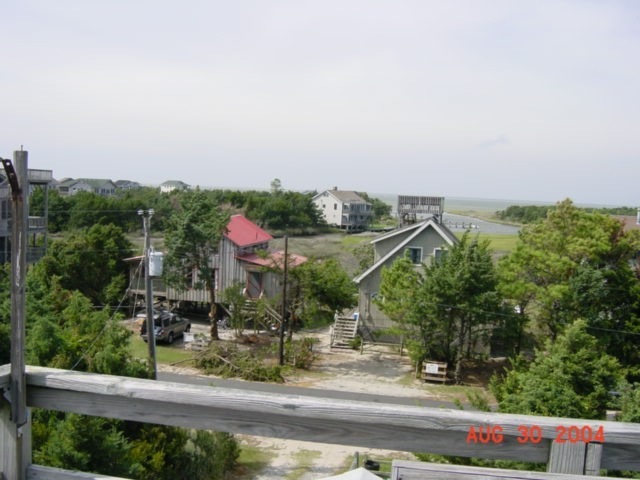 Due to progress they have since been corralled and remain an Island feature. If visiting don’t miss picking up a jar of the local fig preserves. Figs grow wild on the island but also look for the Apple trees which have been growing on the island for hundreds of years. In recent years I have found Prickly Pear Cactus growing as well. 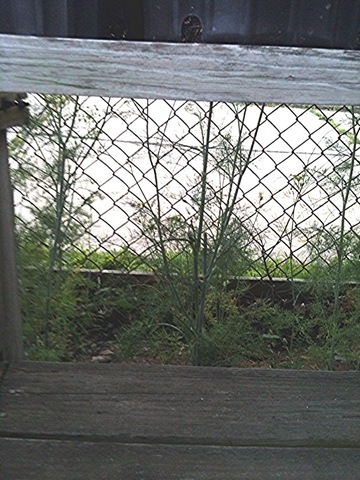 I also recently found, what I think is, the worlds largest rosemary plant growing there. It was in somebody’s front yard! 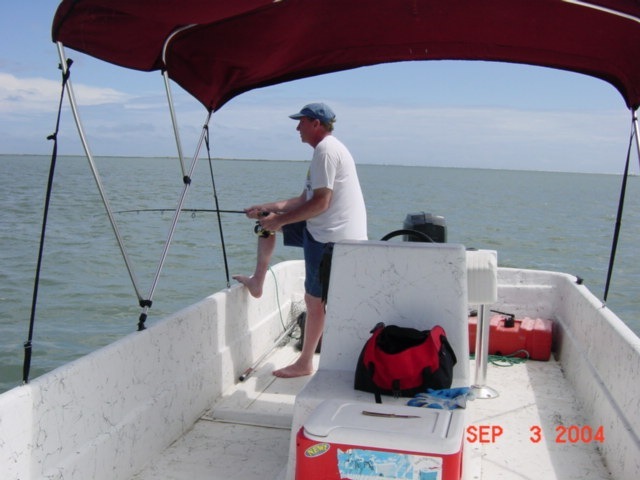 In addition to being a fisherman’s paradise there is also clamming and crabbing available. While I was investigating Tai Pan bakery (31664 John R, Madison Height) I noticed that just a couple of stores away there was a Chinese BBQ Shop. I wandered in to investigate and tried to ask some questions of a gentleman sitting behind the counter. I was disappointed that he chose not to speak with me considering that I just wanted to write about his shop. Perhaps he thought I was the health inspector or something. In any case he did have the interesting fare. In addition to roast pork( very good) he had several roast ducks and chickens hanging up. As in many other culture nothing is left to waste and this place was no exceptions. Behind the glass showcase there were duck feet and wings, fried pork intestine, spare ribs and even BBQ squid. 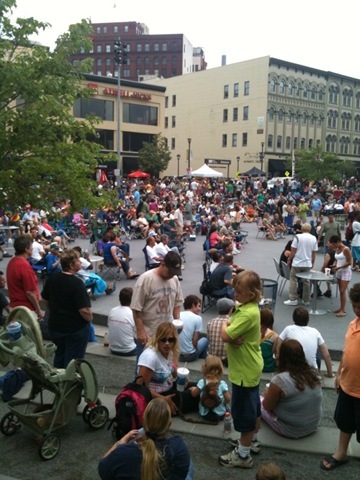 All items were available by the pound and several “lunch box’ combinations were available. 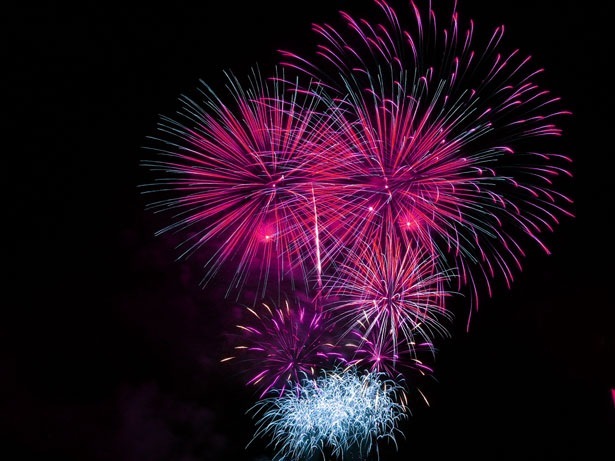 Zhang BBQ is open 10 AM – 8 PM Monday through Friday and 9 AM – 3 PM Saturday and Sunday but bring cash as charges are not accepted. Many years ago I attended the New York Restaurant School. This was my first experience with formal culinary education. It was a tremendous experience that set my course in life. Amongst the instructors was a gentleman who taught butchering named Jack Ubaldi. He was a great man! If you click on the link you can learn more about this well known butcher, restaurateur, author and teacher. Under his tutelage I learned how to break down a side of beef,pork, lamb. 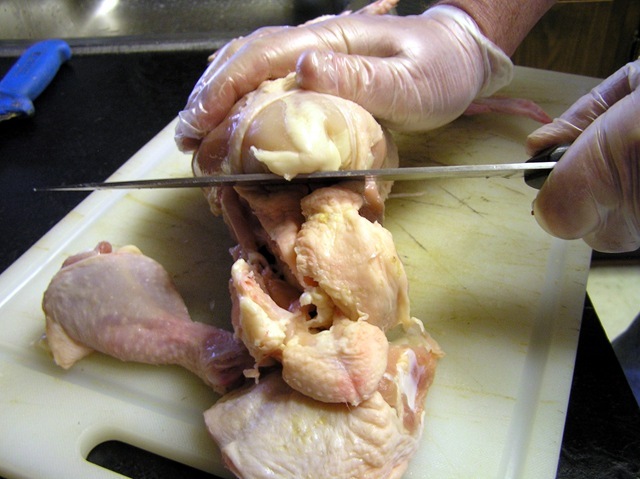 How to break poultry down and, something no chef I have come across knows how to do, remove the bones from a chicken while leaving the skin and carcass intact ( I will cover this in another post!). These are skills I use to this day! One of Jack Ubaldi’s best known traits was to bring a bottle of wine with him to class. I remember fondly Jack giving me the keys to his locker and being sent for the wine because it was not enough to learn how to butcher, we had to learn how to cook what we cut!. 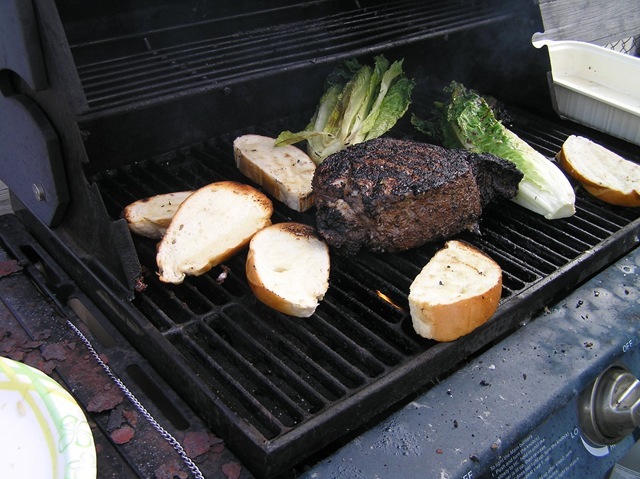 We would cook a Newport Steak or Denver Ribs or whatever we worked with as part of our class. Butchering is a lost art. 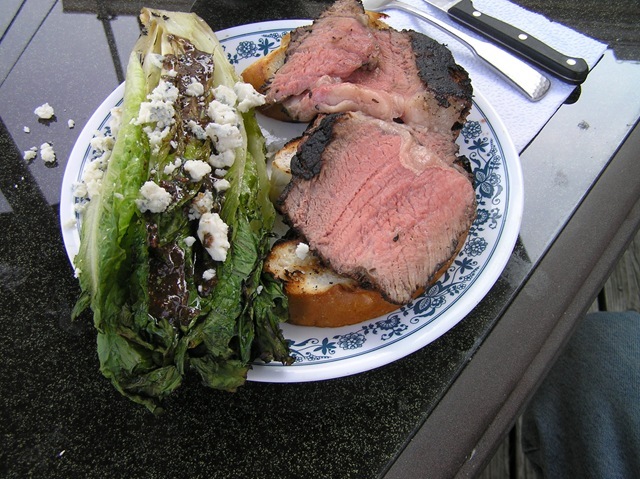 As much as the American Culinary Federation does to keep standards high for skills required to be a Certified Chef, there are a large number of practicing culinarians who call themselves Chef who have no concept of how to break down a side of beef into quarters and then usable cuts or could explain the confirmation of various animals. 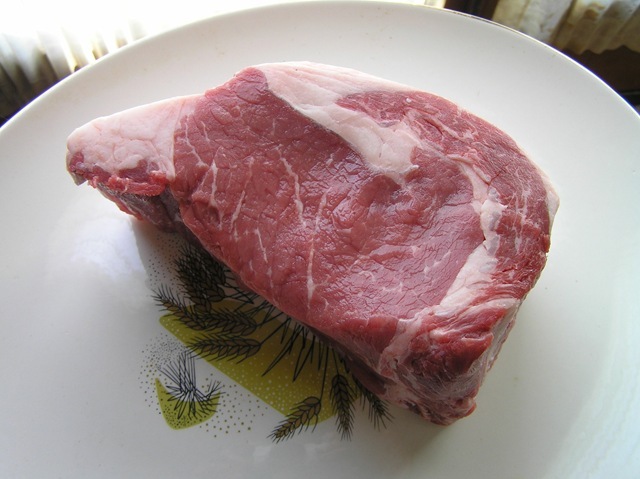 This is due in large part to the prevalence of portion cut beef and chicken that has eliminated the opportunity for Chef’s to use this skill. 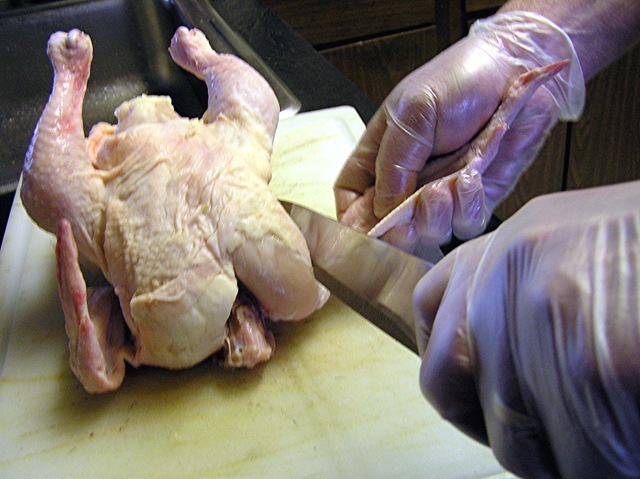 One of the easiest tasks of butchering involves breaking down Chicken into individual pieces. 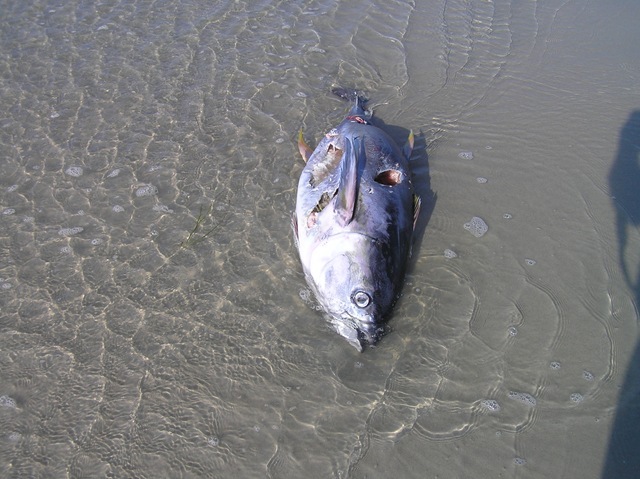 The process starts by removing the wings from the carcass. 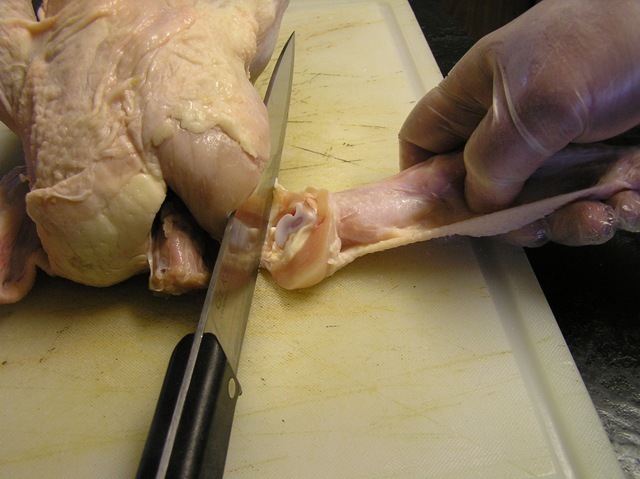 The second is to remove the leg and thigh and then separating the leg from the thigh. 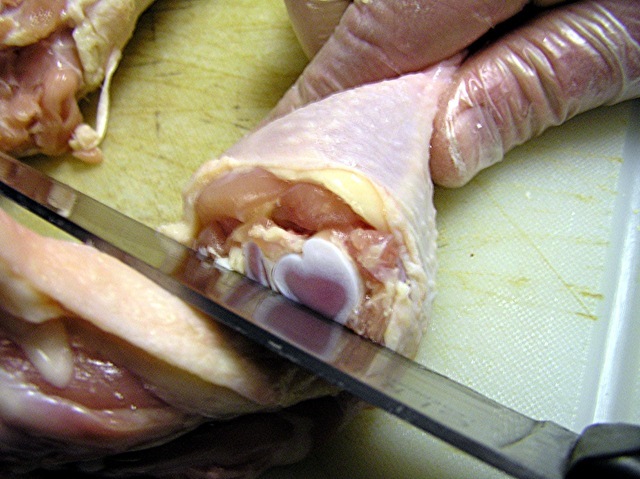 The most important thing to remember is to use the path of least resistance ( Note the center picture where there is a separation of the darker meat –leg, and the lighter flesh – thigh). This is where you want to make your cut. 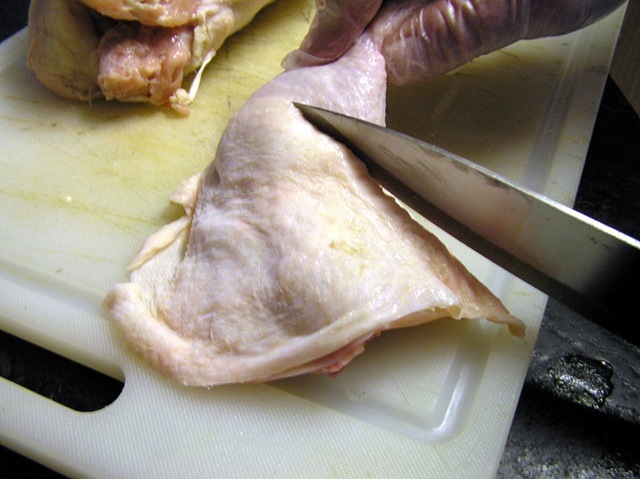 Your cuts should be through the cartilage instead of the bone. 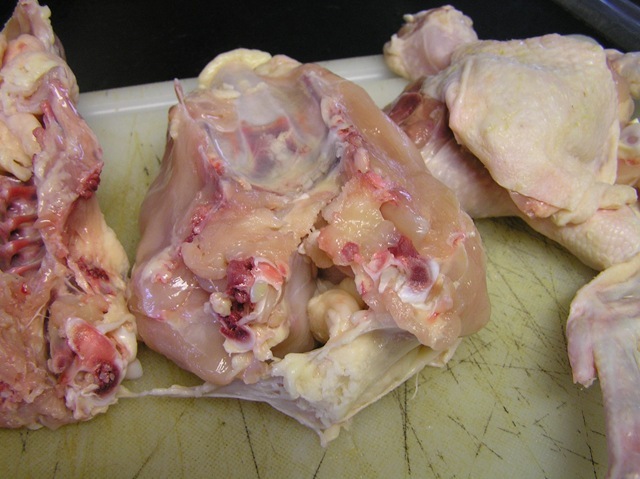 Lastly the breast should be separated from the back and either left bone in or ( in a further step) made boneless.It can the be split into 2 pieces through the central breast plate (which in a young chicken is cartilage).